If you are looking for real Texas-style smoked meat flavor without firing up a smoker, you’ve come to the right bottle. 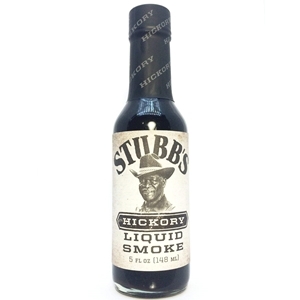 Stubb’s Hickory Liquid Smoke will give your Bar-B-Q the sweet, smoked flavor of real hickory. 5 fl. oz. Water, Natural Hickory Smoke, Organic Tamari Sauce (Water, Organic Soybeans, Salt), Cane Sugar, Organic Distilled Vinegar, Caramel Color, Salt, Contains less than 0.5% of: Garlic, Onion.